This week has been full of travel news for points and miles collectors. These are some of the latest tidbits to get you up to speed. Redeeming Delta SkyMiles is not always the easiest task, but there is a new flight starting between Seattle/Tacoma and Shenzhen, China on SkyTeam airline Xiamen Air. It is operated by a new Dreamliner 787 and features lie-flat seats in business class. This could be a great option for redeeming miles if you can’t find space on Delta or its other partners. The new flight begins Sept. 26. Xiamen is also launching a new flight between Xiamen and Vancouver. Xiamen, China Eastern, and China Southern are all SkyTeam members and offer plenty of connection,u opportunities to other cities. Singapore Airlines will switch its current Singapore-Moscow-Houston flight to operate via Manchester. This is a great opportunity to redeem miles with a Star Alliance program to experience Singapore’s renowned service when traveling to Europe or Asia. The first flight leaves Singapore on Oct. 30, but it is possible to redeem miles on just one segment of the flight to go only to Manchester. Often, there is better award availability on these types of direct flights making this a good route to watch when it comes to redeeming miles. Go through the MileagePlus Shopping portal to earn bonus miles between now and Aug. 12. Customers will get mileage bonuses based on how much they spend at various retailers through the portal. There are hundreds to choose from including everything from clothing to beauty products. 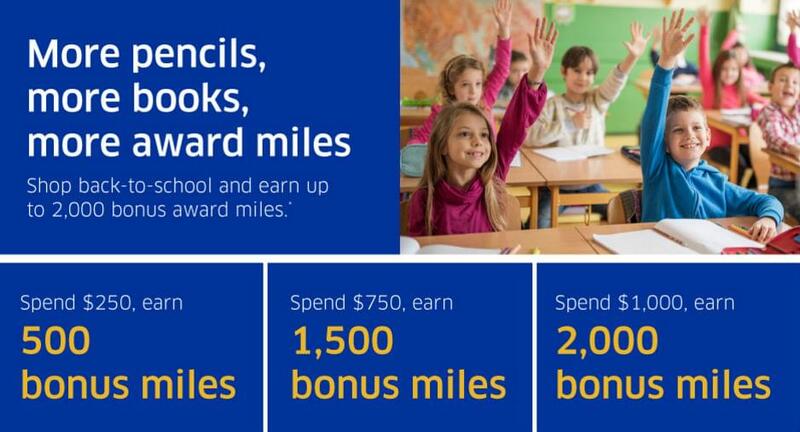 Spend $250 and receive 500 miles; spend $750 and receive 1,500 miles; or spend $1,000 and receive 2,000 miles. The spending total is cumulative and can be made at any participating retailer. In addition to taking away complimentary access to American Airlines Admirals clubs (effective July 23, 2017), Citi Prestige cardholders are losing additional perks that come with the $450 annual fee. The three complimentary rounds of golf will no longer be available beginning July 23, and the much-loved fourth hotel night free benefit will be altered to depend upon the average nightly rate of the stay. Singapore Airlines is putting some of its partner Silk Air’s flights on sale when it comes to redeeming miles. Take 50% off on flights booked between now and Aug. 4 (and flown by Oct. 31). Singapore’s SilverKris program is a transfer partner with Chase Ultimate Rewards, American Express Membership Rewards, and Citi Thank You. Starwood Preferred Guest members can also transfer points to Singapore’s mileage program. If you want to experience one of the most amazing first class mileage redemptions, your odds just got a whole lot better. Etihad will replace another of its JFK flights with the A380 effective next summer; this means there will be two daily A380 flights between JFK and Abu Dhabi. You’ll have a better shot at redeeming American Airlines miles (115,000 miles one way) for the first class apartment. It’s worth it, especially on that long of a flight! The airline also flies the A380 from Abu Dhabi to London, Melbourne, Mumbai and Sydney. Like Delta and Emirates, China Eastern is launching its own partnership with Starwood giving elite members reciprocal benefits when traveling with either company. The program, known as Eastern Explorer Rewards, will give Starwood members bonus points when traveling with China Eastern and China Eastern frequent flyer members can earn miles when they stay at any Starwood hotel. Unlimited flying to Europe…in business class! La Compagnie is offering the chance to buy a one-year pass to unlimited flying aboard its all business class 757s from Newark to either London or Paris. The pass is limited to only 10 people and it retails for $35,000. If you are tired of looking for bargain fares (or mileage redemptions) in business class or anticipate (or desire) traveling to Europe monthly (heck, even weekly), this could be a great deal. The pass must be purchased by July 30. If you purchase a travel-related expense of more than $500 with your American Express credit card, you could receive $80 back as a refund. As part of the Amex Offers program, it requires cardholders to check their account to see if eligible and select the offer to benefit. There are a few exclusions to the travel category, however, including car rentals and cruises. If you hold the Starwood American Express credit card, this could be your lucky day. Simply add an authorized user to your account and receive 2,500 bonus points. Take advantage of this offer between now and Sept. 19, and there is no purchase necessary. This offer ends on Sept. 30. One of the perks of many credit cards (like the Platinum American Express or Citi Prestige cards) is that the fee to enroll in Global Entry is waived. If you have not taken the time to apply or complete the interview, you now have another option. A new Global Entry enrollment center will open in London, the first outside the U.S., this fall. Both U.S. and U.K. citizens can apply for Global Entry. The airline’s long haul flights across the Pacific Ocean are getting more comfortable now that its glitzy new business class has been installed on several planes (the entire fleet will still take many more months). The lie-flat seats are fitted in a 1-2-1 configuration on board. Passengers have access to the airline’s inflight bar or simply recline in their own private cocoon for the flight. In addition to Virgin Australia’s own loyalty program, Delta SkyMiles members can redeem miles to travel on Virgin Australia.